UDM Downloads > Recovery for Excel! 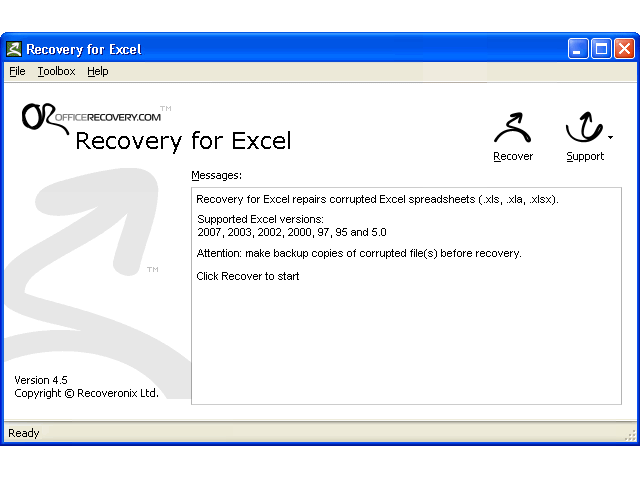 Recovery for Excel fixes corrupted Microsoft Excel spreadsheet files (.XLS). Unfortunately, bad floppies and corrupted file systems pop up and scramble Excel spreadsheets at the worst possible times. Everybody knows the sinking feeling of discovering that an important spreadsheet has been corrupted. Important sales data disappear, analysis has to be redone, and vital research is compromised. When this happens, Recovery for Excel can save the day. Supports all modern file versions, including Excel 2007, Excel 2003, Excel XP, Excel 2000, Excel 97, Excel 95 and Excel 5.0. This simple application is easy to set up and easy to access when trouble strikes. Featuring full install/uninstall support, Recovery for Excel adds a Recover selection right into Excel's File menu. The program fits conveniently and seamlessly into Excel making it a natural both for beginners and pros. Recovers cell data: text and numbers as well as formulas. Restores formatting. Restores structure of multi-sheet files. Recovers corrupted files with password protection (if the password is known), restores worksheet names. The new Recovery for Excel is capable of restoring charts, both embedded into data sheet and placed as separate page. Available for all modern platforms: Windows 95/98/NT/2000/ME/XP/2003 Server.